Apple's revamped Mac mini is both easier to repair than most recent Macs and its 2014 predecessor, according to a teardown published on Friday. 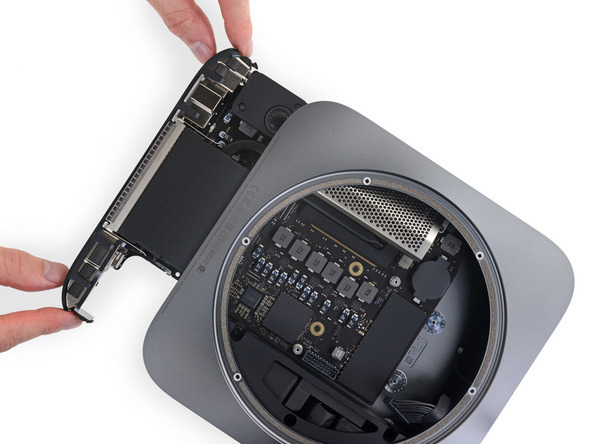 Once a Mini is open, the logic board for instance can be removed with thumb presses instead of a tool. RAM is safeguarded under a shielding cage, letting it operate at high frequencies without generating electromagnetic interference, but can still be swapped out at will. This contrasts with the 2014 Mini, which used soldered, non-upgradable chips. Some other components like the 150-watt power supply can also be easily removed. iFixit ultimately scored the computer 6 out of 10 for repairability, distinctly better than Macs like the 2018 MacBook Air, which garnered just 3 out of 10. "Back in the day, a Pro Mac meant a computer you could upgrade, configure, and connect as you pleased," iFixit wrote. "This new Mini aligns so well with that ideal that we're surprised it didn't earn itself a 'Pro' title — especially compared to the increasingly closed-off MacBook Pro line." Update: The Mac mini has a pair of Thunderbolt 3 controllers, as opposed to one. This makes it equivalent to the bandwidth and performance of the 2018 15-inch MacBook Pro, and iMac Pro from an I/O perspective. Apple has often chosen to glue or solder Mac components together in the pursuit of smaller and/or more efficient designs. That's resulted in criticism from professionals and hobbyists who would rather fix or upgrade devices on their own, especially given the premiums Apple charges for factory customization. The 2018 Mac mini includes a variety of upgrades, including faster internals, Thunderbolt 3/USB-C ports, and optional 10-gigabit Ethernet. Starting at $799 it's the cheapest new Mac a person can buy, though its cost doesn't include a monitor, keyboard, or mouse.